Milan was left without an opera theatre on the night of 25th February 1776, when the Teatro Regio Ducale was destroyed by fire in mysterious circumstances. The empress, Maria Theresa of Austria, appointed the architect, Giuseppe Piermarini, to build a new theatre. The site chosen was the degraded area of the Church of Santa Maria della Scala, so named in honour of Beatrice Regina della Scala, the wife of Bernabò Visconti. The work was completed in just two years – from 1776 to 1778. And so began the story of the Teatro Grande alla Scala, destined to become one of the most important focal points for both Italian and European culture. On the night between 15th and 16th August 1943, the Theatre suffered considerable damage during air raids carried out by the Royal Air Force. Reconstruction began with an unusual concert amidst the wreckage, the orchestra seated in front of the curtain and the audience on ordinary chairs. 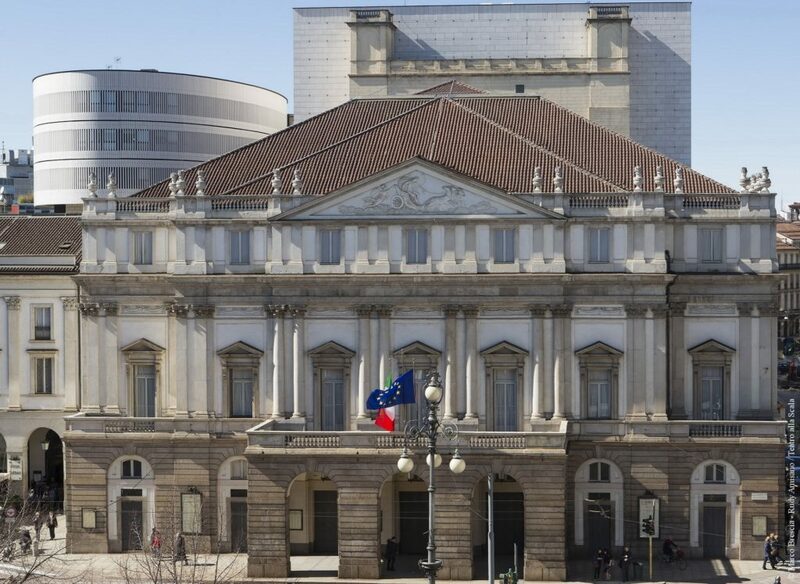 The Teatro alla Scala was rapidly rebuilt and on 11th May 1946 it reopened in all its original splendour with a memorable concert conducted by Arturo Toscanini. Between January 2002 and December 2004, Mario Botta carried out the most profound work of restoration and modernization seen at La Scala since the end of the Second World War. The fly tower and the oval tower, which can be seen from the outside of the building, stand as a testament to this renovation.